You might think complaining about business class is snobby, but let’s put relative comfort aside for a minute. 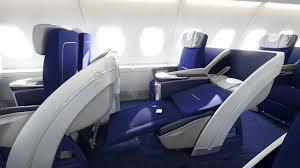 I am very glad to hear that Lufthansa is upgrading its long-haul business class between now and next year. I have explicitly avoided flying business class on Lufthansa despite being an avid Star Alliance patron for quite some time. The present generation of business class seats are sub-par at best. Despite having adequate width and straightening out to be “flat”, the seats do not lay completely horizontal, which gives the unpleasant of feeling like you are sliding down somewhat. And, the mechanism to adjust the seat from an upright position to lay-flat is so clunky and mechanical, I was left wondering if it was reclining or I was getting a Swedish Massage. The flight that was the “straw the broke the camel’s back” was from Bangalore to Frankfurt, which left at the unpleasant time of around 3 15 AM, which admittedly is typical yet strains one’s patience. The cabin was freezing and when I awoke, being a bit hungry, I was informed there was no snack or food available. The stewardess did help by retrieving two rum-balls from first class (yeah, super helpful). I was actually uncomfortable. This caused me enough dismay to write to Lufthansa with some objective, but emphatic, feedback about my experience and expressed that I really had no intention of flying them again if I had a choice. The customer service people responded with a 50 Euro credit for me to use on my next Lufthansa flight and cheerily proclaimed that their business class was among the best. I am not the first person to think otherwise, as some blogs would say. I gave the credit away, and I have yet to fly them again. Slip, Slide and Swedish Massage, anyone? Never again. The bottom-line: Check the likelihood of not getting the new business class configuration, and avoiding flying Lufthansa business class if you have a better choice (like Emirates), unless its the new cabin.